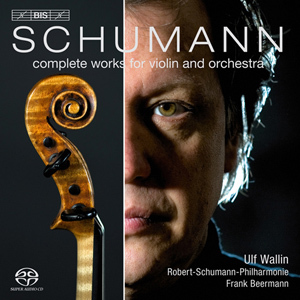 You could be forgiven for not knowing that Schumann wrote any concertante works for violin and orchestra. The reputations of these three pieces have suffered a bizarre series of misfortunes, but listening to this fine recording, it is hard to believe that the music itself is at fault. Virtually every performer who encountered these works in the first century of their existence felt the need to correct of improve them. Rostropovich decided that the Cello Concerto, of which the A minor Concerto is an arrangement, required wholesale re-orchestration by Shostakovich. Fritz Kreisler felt the need to 'rescue' the Fantasy in 1937 by essentially recomposing it. The D minor Concerto suffered the worst fate of all. It was rehabilitated in the 30s, but by the Nazis, keen to find a substitute for the Mendelssohn Concerto they had banned. So it is hardly surprising that the work's post-War reputation has been poor. Most of the revisions and edits to these scores over the years have been justified by the belief that they are excessively gloomy pieces in need of brightening up. Ulf Wallin and Frank Beerman have had the good sense to go back to Schumann's original scores to see if that is true. And no, its not true at all. There are shades of Beethoven in one of his more earnest moods in many passages, but like Beethoven, Schumann has the lightness of touch, both in his voicing of harmonies and in his orchestration, to keep the music afloat. The full range of the violin is used throughout all of the works, and Schumann takes more interest in the instrument’s lower register than most. In the case of the A minor concerto, this may be because the work was originally written for cello. (The version for violin is the composer's own, and was only discovered among Joseph Joachim's papers in 1987.) But the other works are violin originals, suggesting that the composer took a real interest in these lower notes. Those lower register passages impose unusual technical challenges, the solo part must retain its flair without the benefit of the projection that high notes can bring. Balance is another issue, and good as Schumann's orchestration is, the string writing in particular is often quite dense. Fortunately these players are well aware of all the potential problems, and the results are excellent. The SACD sound is good, and this is one of those high definition recordings that manages to use the clarity of sound to convey atmosphere as well as detail. It does highlight a slightly lack of precision in the string ensemble, but nothing serious. The relationship between soloist and orchestra is also presented with both clarity and subtlety. Wallin is clearly distinguishable but also sounds as if he is positioned very close to the orchestra. This is a real benefit, especially in the D minor concerto, where Schumann often blends the solo line subtly into the background textures.